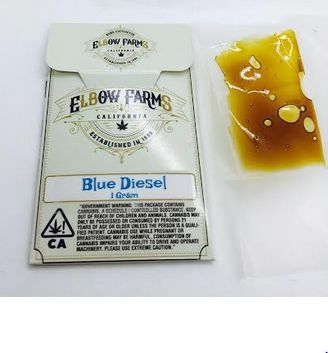 Blue Diesel Shatter-Elbow Farms Wax Daughter of indica-dominant Blueberry and sativa-dominant NYC Diesel, Blue Diesel (also known as Blue City Diesel) falls on the slightly indica side with a pleasant, moderate to long-lasting body buzz. Thanks to its Blueberry genetics, this flower emanates a light berry aroma that is smooth, expansive, and fast-acting. This strain is optimal for daytime and comes with little to no fatigue or increased appetite, making it a desirable option for medical marijuana patients. Originally produced by Breeder’s Choice, this plant may provide just the relaxation you need.